After growing up on a steady diet of Disney movies, Disney soundtracks, and Disneyland, I was excited like you wouldn’t believe to visit the Walt Disney World Resort in Orlando. The complex is the size of a small island nation. 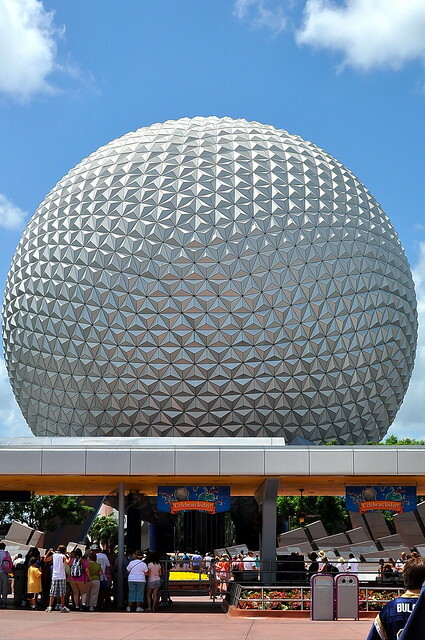 In addition to dozens of enormous resorts that hold thousands of guests each, it boasts six amusement parks: Magic Kingdom (a Floridian replica of the Anaheim original), Hollywood Studios (Disney’s take on Universal Studios), Animal Kingdom (lions, tigers, and bears), two water parks (Typhoon Lagoon and Blizzard Beach), and EPCOT (Experimental Prototype Community Of Tomorrow). I hope to visit each park someday, but since The Astronomer and I only had one day to pay our respects to the Disney gods, we chose to explore EPCOT. By the way, the park’s “golf ball” centerpiece is called Spaceship Earth and houses a ride that narrates a shortened history of the world. EPCOT is divided into two sections: Future World and World Showcase. We started our day in Future World, which focuses on “technological advancements, innovation, and wonder.” The Astronomer felt right at home there. 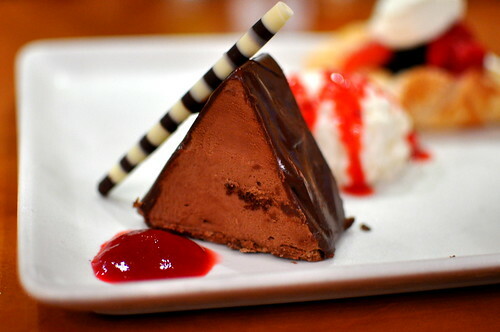 Since nothing works up an appetite quite like using your imagination, we soon headed to World Showcase to grab a bite. 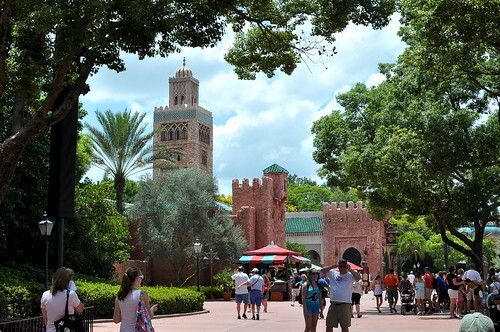 Set around a man-made lagoon, World Showcase is comprised of a collection of pavilions representing the cultures and cuisines of Mexico, Norway, China, Germany, Italy, United States, Japan, Morocco, France, United Kingdom, and Canada. 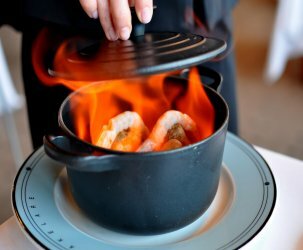 Each country has a formal, sit-down restaurant that requires advance reservations either by phone or in person at guest services. As soon as we arrived at the park, The Astronomer and I booked a table at the Norwegian restaurant because The Astronomer’s mother recalled enjoying a buffet with an abundance of smoked fishes the last time she dined there. For lunch, The Astronomer and I walked to Morocco. I was excited to learn that all of the cast members were Goodwill ambassadors from the country. We settled on Restaurant Marrakesh because it served one of my favorite Moroccan dishes—bastilla. Our waitress found it strange that we only ordered one item off of the entire menu, but we couldn’t afford to fill up on Moroccan food when there were still ten other countries to visit! 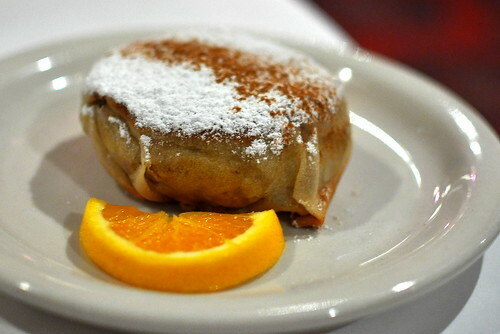 The sweet and savory pastry was filled with shredded chicken, raisins, nuts, and spices, and topped with a restrained amount of powdered sugar and cinnamon. It wasn’t the greatest rendition of the dish, but considering that the bastilla was made at an amusement park, the flavors hit the Moroccan spot. We strolled over to Japan for courses two and three. 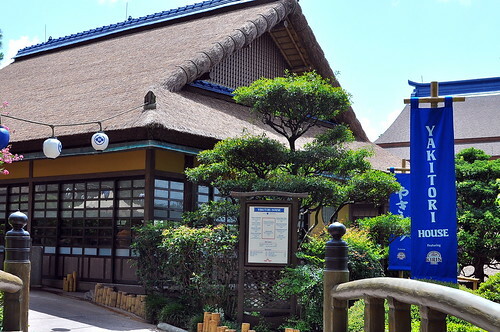 Whereas Restaurant Marrakesh was a full service restaurant, Yakitori House offered fast food and little fuss. 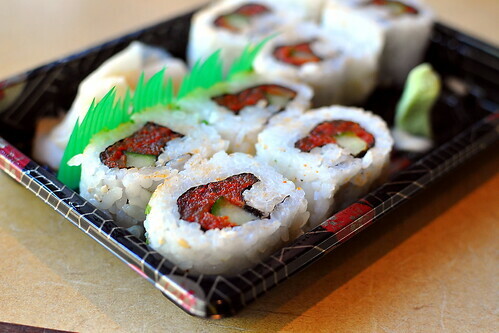 I ordered a spicy tuna roll ($7.79). The fish was well spiced and contained a smattering of scallions, while the rice was overworked and too densely packed. The sushi at Yakitori House was certainly better than the stuff sold at the grocery store, but nowhere near restaurant quality. 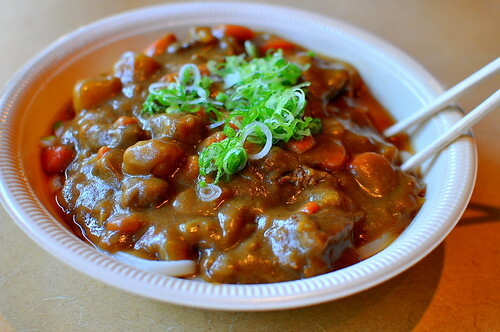 The Astronomer’s curry udon ($9.29), on the other hand, was really tasty. The noodles had a bit of a bite to them, while the curry was deeply savory. I stole more than my fair share of slurps in between bites of my so-so sushi. 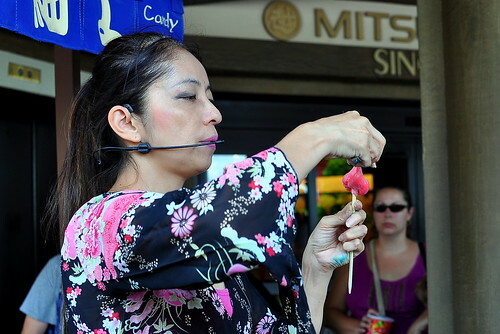 Before heading back to Future World for more thrilling action, we stopped to watch a Japanese candy artist perform. She is making a pink flamingo here. 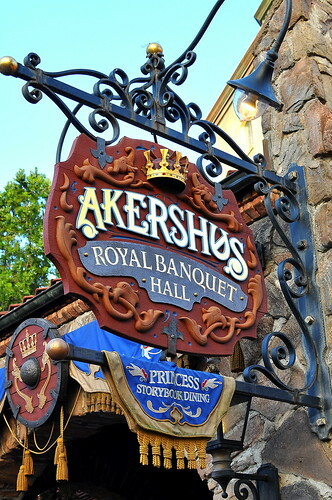 When eight o’clock rolled around, we headed to the Akershus Royal Banquet Hall to feast on Norwegian fare. The restaurant is modeled after a 14th century Scandinavian castle and has high-beamed ceilings and leaded-glass windows. Truly, it was the perfect setting for Princess Story Book Dining. While we ate our supper, princesses Cinderella, Jasmine, Ariel, Belle, and Aurora came by the table to meet and greet. Check out the collection of memories here. To start, a Norwegian buffet (koldtbord) of cold dishes including smoked, cured, and pickled fishes, deli meats, traditional cheeses, and salads. 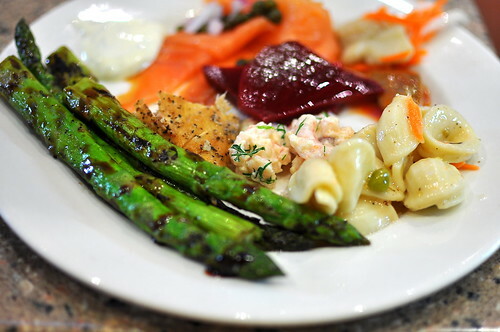 I made a sampler platter with a little of everything and then returned for my favorites—grilled asparagus, smoked salmon, and pasta salad. 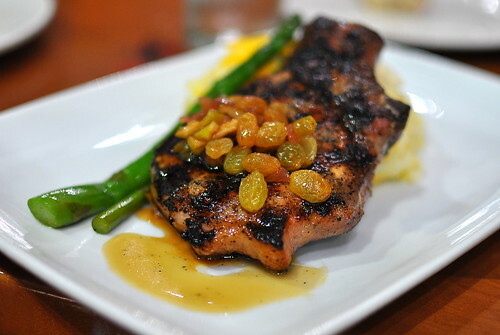 The Astronomer ordered the grilled pork chop with potato gratin and apple-raisin chutney. Roughly the size of my head, the chop was juicy and moist. 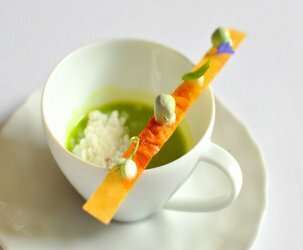 I’m not sure what aspects of this dish were Norwegian, but we enjoyed it nevertheless. 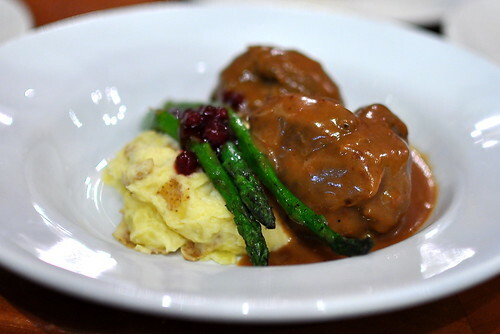 I ordered the traditional kjottkake, ground beef and pork meatballs served with mashed potatoes, asparagus, and lingonberry sauce. The flavors were reminiscent of Thanksgiving dinner, but with a Nordic twist. Our waiter, a fine chap from Norway, remarked that only his grandmother’s kjottkake was superior to the version served here. For dessert, a trio of sweets for the entire table to share—chocolate mousse, rice cream with strawberry sauce, and puff pastry filled with mascarpone mousse and berries. The rice cream was easily my favorite of the three. In the span of nine or so hours, The Astronomer and I dug into the cuisines of three distinctly different nations. The plethora of delights were mostly delicious and presented in a manner that struck a balance between cheesy and fun. 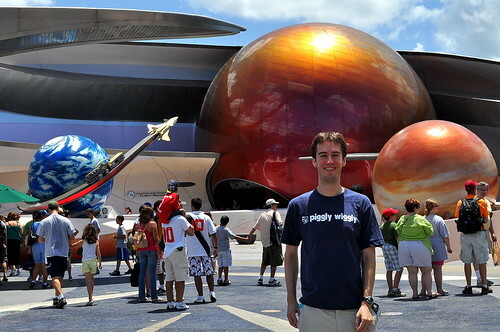 Prior to visiting the park, I feared that EPCOT would be something like Las Vegas, but thankfully it was so much more. I look forward to returning in a few years and doing it all over again. 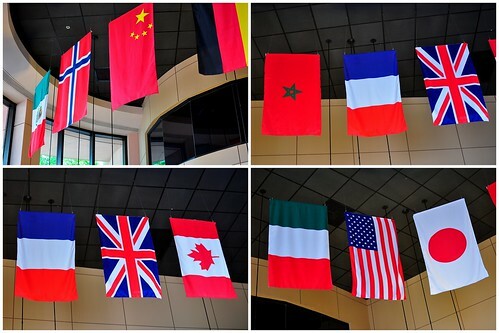 Hopefully by then Vietnam will have joined the collection of nations represented! I’m happy to see you choose Epcot as your one Disney stop. Nick and I ate lunch at the casual restaurant in Morocco, and then the full service restaurant in France when we were there. The food definitely went past our expectations! You told that mermaid to keep her hands off your man, right?! I also did a similar tour around the countries when I went to Epcot…except replace eating with drinking. 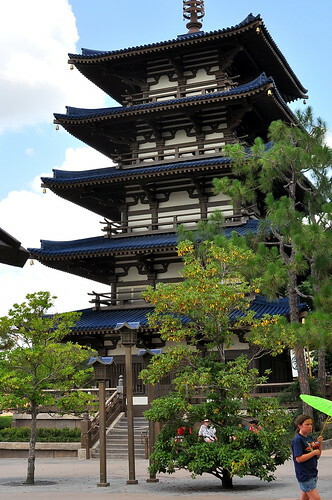 THat’s one of my favorite things about Epcot…. 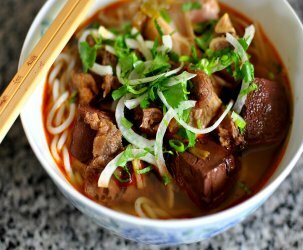 albeit Americanized, you can try cuisines from round the world in one day. Just looking at those pix made me feel the warmth of FL..cuz it sure ain’t here in LA!